Alexander von Humboldt (1769-1859) is the great lost scientist. More things have been named after him than anyone who has ever lived – towns, rivers, mountain ranges, a penguin, a giant squid and even the mare Humboldtianum on the moon. He inspired generations of thinkers and writers – Darwin set sail on the Beagle because of Humboldt, Napoleon was jealous of him and Captain Nemo in Jules Verne’s famous Twenty Thousand Leagues Under the Sea owned all of his books. Yet today he is almost forgotten.The Invention of Nature (Costa Shortlisted 2015) brings this remarkable man back to life. Humboldt predicted human-induced climate change (in 1800! ), discovered similarities between climate zones across the world and invented isobars on weather maps. He predated James Lovelock’s Gaia theory by 150 years when he described the Earth as a living organism and his writing sparked revolutions throughout South America. Award-winning historian Andrea Wulf takes us on a fantastic voyage in his footsteps, whether racing across anthrax-infected Russia or mapping tropical rivers alive with crocodiles. The Invention of Nature shows how his life and ideas revolutionized science, conservation and preservation, nature writing, politics, art – and why they remain so important today. Humboldt revolutionised the way we see the natural world. Humboldt came up with the idea of nature as a web of life. He found connections everywhere. Humboldt regarded nature as a living organism and as a global force. Humboldt linked climate change, environmental devastation with economics and politics. He criticized unjust land distribution, monocultures, violence against tribal groups and indigenous work conditions. Today campaigners like Naomi Klein underline the war between the economic system and the environment while the Pope Francis pointed at the catastrophic consequences of climate change for the poorest people and countries. Humboldt already discussed the same issues two centuries ago. Humboldt is the forgotten founding father of environmentalism. He was, for example, the first to understand the forest as an ecosystem – explaining the forest’s ability to enrich the atmosphere with moisture and its cooling effect as well as its importance for water retention and protection against soil erosion. Humboldt already predicted human–induced climate change in 1800. 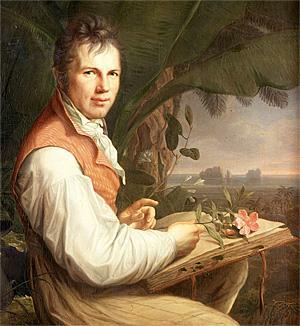 After he saw the devastating environmental effects of monoculture and deforestation in Venezuela, Humboldt realised that the human species was destroying the environment and changing the climate. Humboldt invented isotherms. Humboldt invented the wavy lines which we see on weather maps today and which connect different geographical points around the globe that are experiencing the same temperature. In 1807 Humboldt grasped the idea of shifting tectonic plates. The similarities of coastal plants in Africa and South America, Humboldt wrote, showed an ‘ancient’ connection between the continents – an incredible conclusion more than a century before scientists had even begun to discuss continental movements and the theory of shifting tectonic plates. 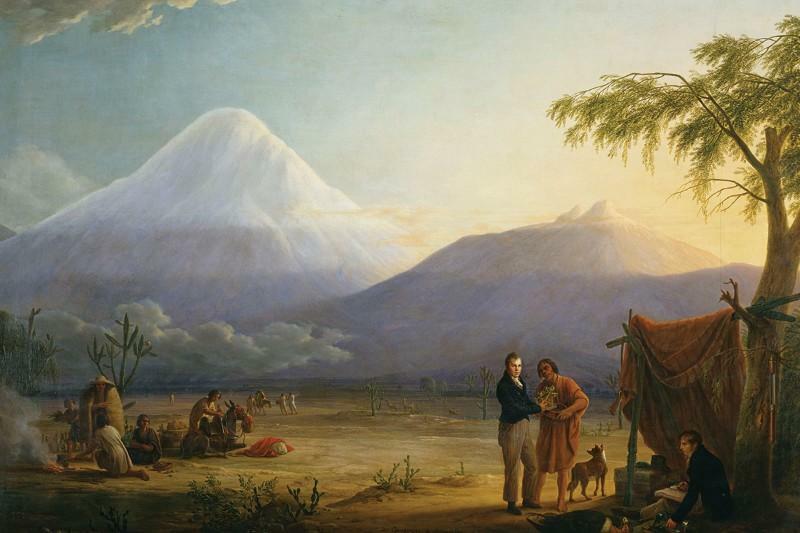 Charles Darwin would have not boarded the Beagle, nor conceived of the Origin of Species without Humboldt. Humboldt shaped John Muir’s ideas of preservation. Without Humboldt, the Scottish–born Muir would have probably never become the so–called ‘Father of the National Parks’ in the United States. Humboldt visited Thomas Jefferson in DC in 1804. Jefferson called Humboldt ‘one of the greatest ornaments of the age’. Thoreau’s Walden would have been a very different book had it not been for Humboldt. Thoreau found in Humboldt’s books an answer to his dilemma on how to be a poet and a scientist. Simón Bolívar’s revolution in South America was invigorated by Humboldt’s writing. Humboldt’s descriptions of the natural world and ancient civilizations, made the colonists appreciate how spectacular their continent was.